The butterfly challenge HERE this time is F for Faux or the colour jasmine. I have to say upfront that my entry is a bit tongue in cheek and if it doesn't qualify I won't be surprised - or upset. Daisy Trail were offering a special deal on quilling digi kits so I thought I'd take up the offer for fun just to see what they were like. So... some faux quilling digital style with a card made entirely in Craft Artist with no coiled paper harmed in the making!! I imagine my friend Jill of Jill's Quills will be amused if not horrified to see this and I could well be drummed out of the Quilling Guild!! Faux or not Val, those butterflies are beautiful. Lovely card Val, love how CA looks so real! Well darn me if this just doesn't take the biscuit!! 10 out of 10 for such an unusual if not totally unique faux technique. I absolutely love it. You have been spared the naughty step ( this time round). 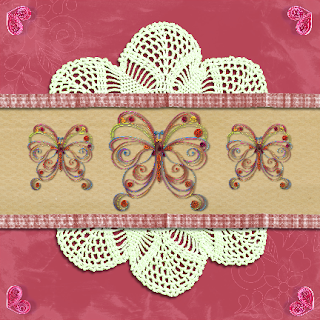 Thank you so much for fluttering by my butterfly challenge. Hugs Mrs A.